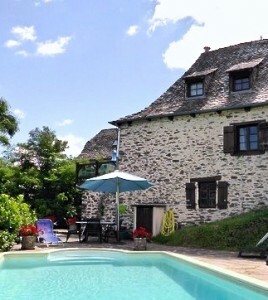 Le Bourg is a stunning classically French manor house sleeping 12 with heated private pool set in 5 acres of grounds on the outskirts of Lacroix-Barrez, a small and pretty village on the southern Cantal /northern Aveyron border, in South-west France. Drive through the gates and you see before you the house, flanked by yew hedges leading to the front courtyard. Double ‘bullnose” steps lead up to the front door and into the grand entrance hall. 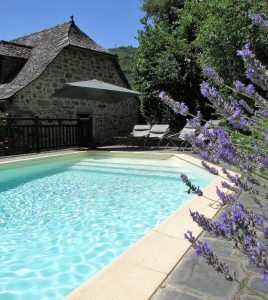 The house is beautifully and luxuriously furnished with classic French furniture and modern pieces – a spacious house, ideal for larger families and groups. 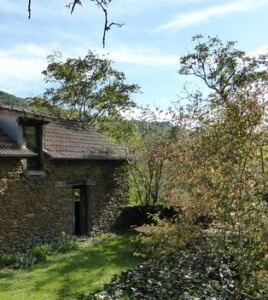 There is also an independent cottage for 4 guests, which is never booked when the house is occupied, unless by the same group. Please contact regarding prices for booking both properties. 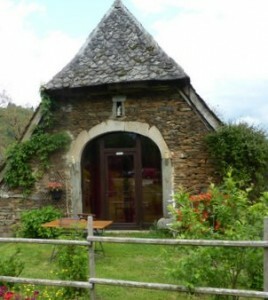 Le Bourg is located on the outskirts of Lacroix-Barrez where there is a small grocery store selling fresh bread and a café. 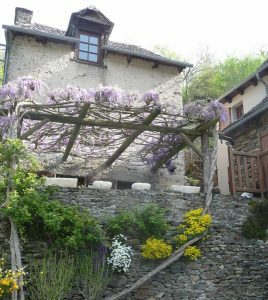 The lovely town of Mur-de-Barrrez is 10 minutes drive and has a wide range of shops, banks, pharmacies, restaurants, supermarkets and a weekly market. 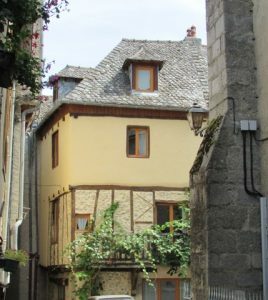 Half an hour to the south is the medieval town of Entraygues which provides a full range of shops including local butchers and bakers and Friday farmers markets. Leisure amenities include river rafting, horse riding, river walks, numerous cafes and restaurants and in the summer night markets provide local speciality food and entertainment in the market square. The large towns of Aurillac (40 minutes) and Rodez (1h 15) both offer extensive shopping, culture, restaurants and activities to suit all tastes. 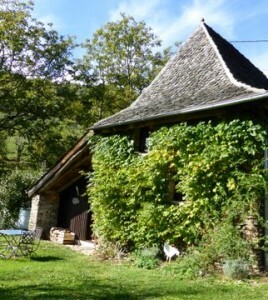 Le Poulailler is one of four beautifully converted former outbuildings of the 18th century farmstead “La Domaine du Puech” overlooking the valley of the Auze river, which flows into the Lot in the nearby village of St Projet. 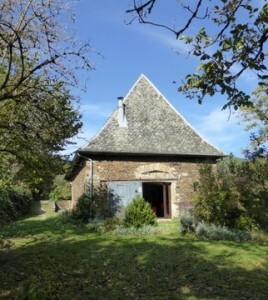 Combining the original chicken house and chestnut store, the gîte accommodates up to 3 guests and has been sympathetically renovated to bring together the original 18th century features and the style and convenience of the 21st. 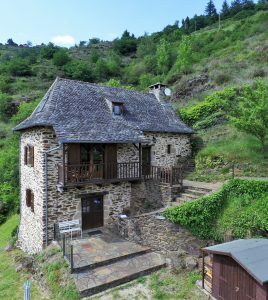 The local schist stone walls with slate fishtail tiled roof particular to the area and the traditional chestnut timbers provide a dramatic backdrop to the comfortable modern fittings. 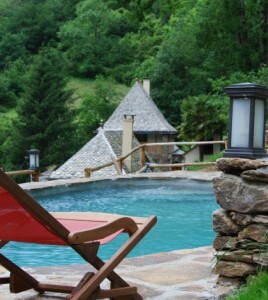 There is a communal pool for use of guests. 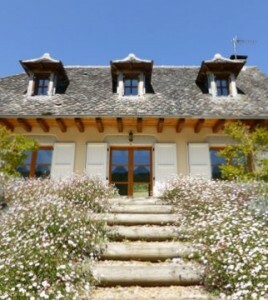 La Grange Fleurie is one of four beautifully converted outbuildings of La Domaine du Puech, an 18th century farmstead situated in a stunning hamlet high above the valley of the Auze river, which flows into the river Lot in the nearby village of St Projet. 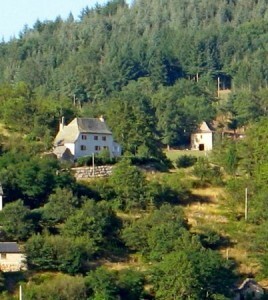 Ideal for one couple, La Grange Fleurie is a spacious converted barn constructed of local schist stone with a slate fishtail tiled roof particular to the area, which has been sympathetically renovated to bring together the traditional features of the 18th century and the style of the 21st. 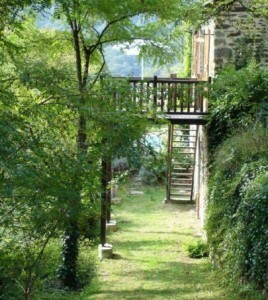 There is a communal pool for use of guests. 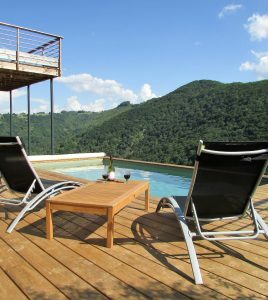 Calvinet is renowned locally for it’s Christmas market and illuminations, so why not take a winter break in this beautiful unspoiled part of France? 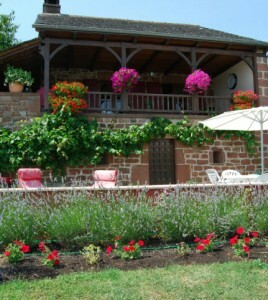 The La Grange Fleurie is a short drive from Conques, which dates back to the 9th century and is magnificently preserved. 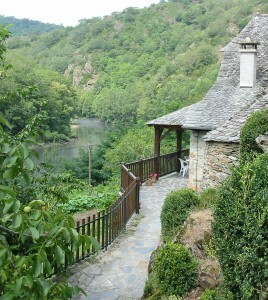 Classified among the most beautiful villages in France and a UNESCO “World Heritage Site”, Conques is also a major staging post on the spiritual path to Saint-Jacques de Compostella. 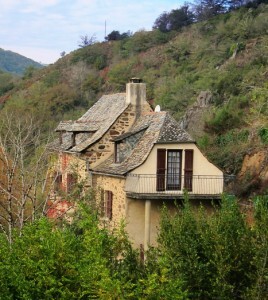 Beyond Conques is Marcillac, a delightful town with banks, supermarkets and post office. Every Sunday morning it has a wonderfully colourful market. The large towns of Aurillac and Rodez are about an hour’s drive and both offer extensive shopping, culture, restaurants and activities to suit all tastes. 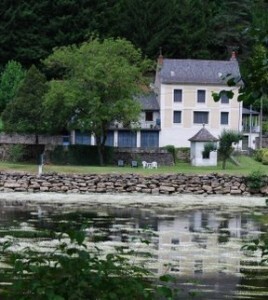 A charming, conveniently located apartment for 2 people overlooking the river and with its own large private riverside lawn. 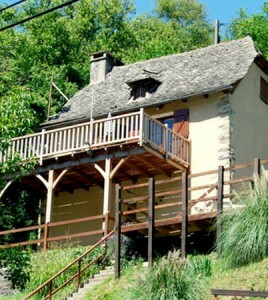 This cottage is within a short riverside walk of shops, restaurants and other facilities in the lovely medieval town of Entraygues-sur-Truyere. 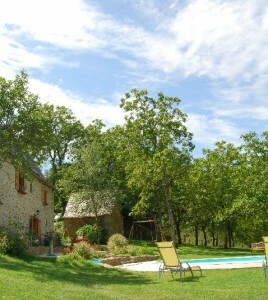 There is a secluded pool and sun terrace for the use of guests. 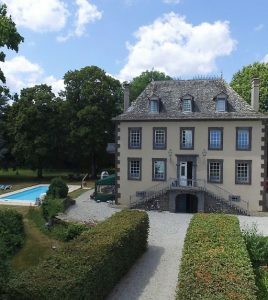 Vue du Pont is ideal for couples who would like to enjoy the riverside lawn, pool and an occasional stroll into the charming medieval village of Entraygues just over the bridge without always using the car. Entraygues is a gorgeous little town with shopping, restaurants, café, post office, bank, etc., and offers farmers’ markets and village festivals during the peak summer months. The large towns of Aurillac and Rodez are about an hour’s drive and both offer extensive shopping, culture, restaurants and activities to suit all tastes.